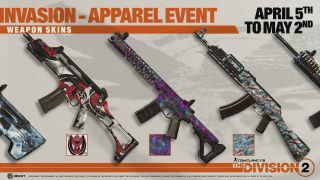 As part of The Division 2's big Tidal Basin update, the game's first apparel event will kick off tomorrow, April 5. It'll run through May 2, during which time players will be able to earn event caches containing unique cosmetics, ranging from weapon skins to emotes to masks. Unlike normal caches, the event caches will never yield duplicate items, so you'll always get something new whenever you open one. All players will receive one free cache so long as they log in by Thursday, April 11, and Year 1 Pass owners will receive three additional caches whenever they log in. Once you claim your freebies, you'll be able to earn more caches by completing new projects. There may be other ways to earn additional caches, such as completing weekly challenges, but from the sound of it, merely earning XP and opening normal caches won't do the trick if you want the fresh goodies. Here's hoping the projects aren't too grindy, because it sounds like there's a fair few cosmetics to grab. The Tidal Basin update is the first piece of Invasion: Battle for DC, which will also add the first eight-player raid, Operation Dark Hours, and a fourth specialization later this spring.